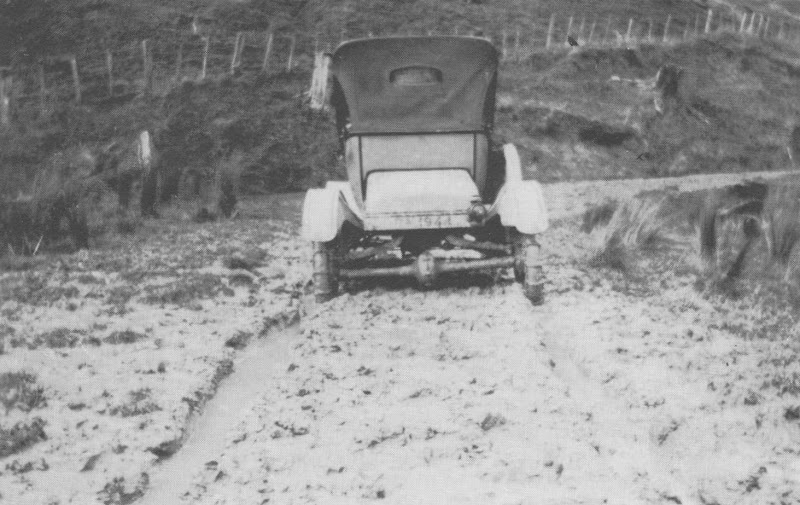 Clay roads in the northern Wairarapa proved a challenge for both horse-drawn transport and motor vehicles in the winter until the middle of the 20th century, as the roads turned to a sea of mud. Some very swampy pieces of road had a scrub mat laid down and clay or shingle over it. 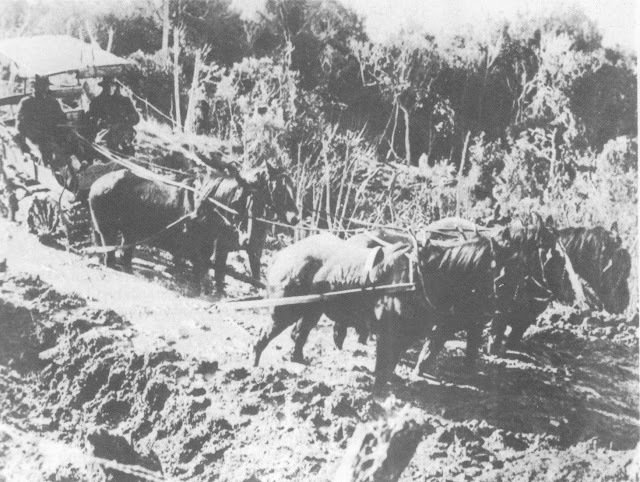 Ponga logs were laid crosswise on scrubby ground (corduroy road) and sometimes sacking was laid over steep slippery bits. For a more permanent surface, papa was burnt in pits by the banks, a slow and expensive procedure. Horses could founder in the mud, throwing their riders to the ground, and teams of horses and carts become completely bogged down. "Continuous heavy rains causing every creek and river to rise into impassible barriers have been the state of things here for days past, yet the rivers are well confined by high banks which don’t allow even the lowlands to suffer from floods, but I fear many of our bridges not being of very permanent construction will be much damaged, while others are likely to be bodily carried away. The bush tracks, I also anticipate, will be in a bad state, not only from the rain, but the high wind will be knocking trees and their limbs down across the tracks. As a gentleman was returning from Masterton to Alfredton along the Upper Taueru road, his horse slipped on one of the planked bridges, which in wet or frosty weather are so dangerous without a little gravel on them. The horse came down heavily on the rider’s leg causing very severe injuries to the knee cap, the pain of which was only equalled by the mental agony of the poor warden in whose charge this road lies. We are happy to state the unfortunate gentleman is doing well, and the poor warden beginning to breathe freely." Bullocks, which had cloven hooves, were more successful at coping with the mud and a team of six to eight bullocks could haul six months' worth of supplies on a cart. In the early days wool was carted by bullock team out to Castlepoint for transport by ship and supplies were brought in on the return journey. Gravelling roads did not begin until the 1940s.